If you need to slot punch a ton of badges, this is perfect for the job. 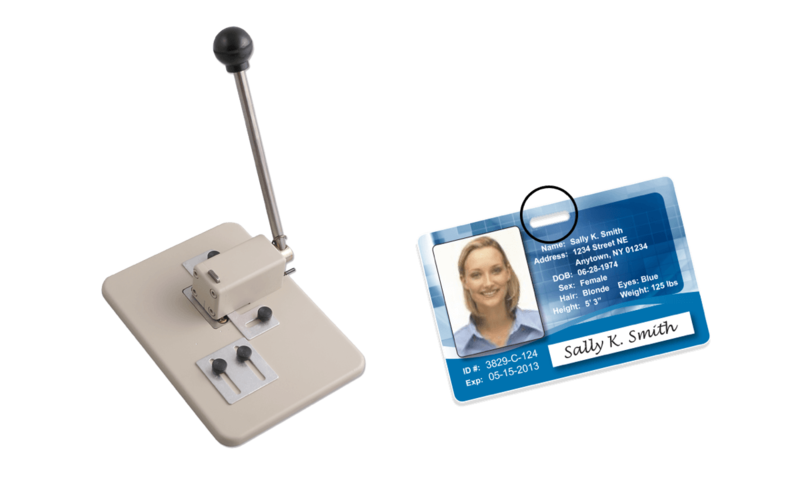 This desktop slot punch creates a 14 x 3 mm slot directly into your ID card or badge which then enables you to hold it to any strap clip, lanyard or badge-reel. The long handle provides great leverage, minimising manual effort on your part and allows for easy hole punching of PVC cards. Built in adjustable guides will give you the option to punch horizontal or vertical ID cards and ensure that your hole is in the same spot for a consistent look and feel to each of your ID cards. Slot punches are ideal for perforating precise holes into ID cards for easy-to-wear badge attachments such as strap clips, lanyards and badge reels! This heavy duty desktop model features adjustable centering guides.